Rest in peace my brother. Descansa en paz mi hermano. I did not know this officer but I did know his fiance. Her father and I were lifeguards together and i remember he leaving the Church after the mass. Proudly mailed my No Parole letter today, on behalf of Officer Fontanez-Diaz. Thank You for your service and sacrifice. Prayers to the family and friends as this difficult time nears. God Bless You All! I am Angela McMinn the coordinator of No parole for Cop killers. An odmp.org Program. I am working on my may report and among those up for parole is David Barracks, The man who murdered officer Hector Fontanez. He will be one of our campaigns to stop parole. Officer Fontanez deserves this fight for justice for Him and his family. God bless you sir and prayers going up for his families, both blood, and blue. But the afternoon of September 12, 1991 will never be forgotten or fade with time. Peace be with you on this 25th anniversary in heaven. Thank you so much for your service to our country. My heart aches for your friends and family. I hope my letter made it to the parole board. You will never be forgotten!!!!! ABSOLUTELY NO PAROLE FOR COP KILLERS. Honored to add my name to this letter writing campaign. Have been a Survivor for almost 46 years. Proud to send my No Parole letter today. You have not been forgotten sir and prayers for God's blessings to those left behind. Time continues to pass, grateful for each minutes God continues to bless me with. However, time never erases the great memories I shared with you. Nor does time erase the pain of losing you way too early. I am grateful for the time I had with you, just wish we could have spent a lifetime together but God seemed to have needed you more. Thanks for the memories and thank you for watching over me from above. It was my honor to research newspapers, magazines, online & books to find your ID CARD Photo. 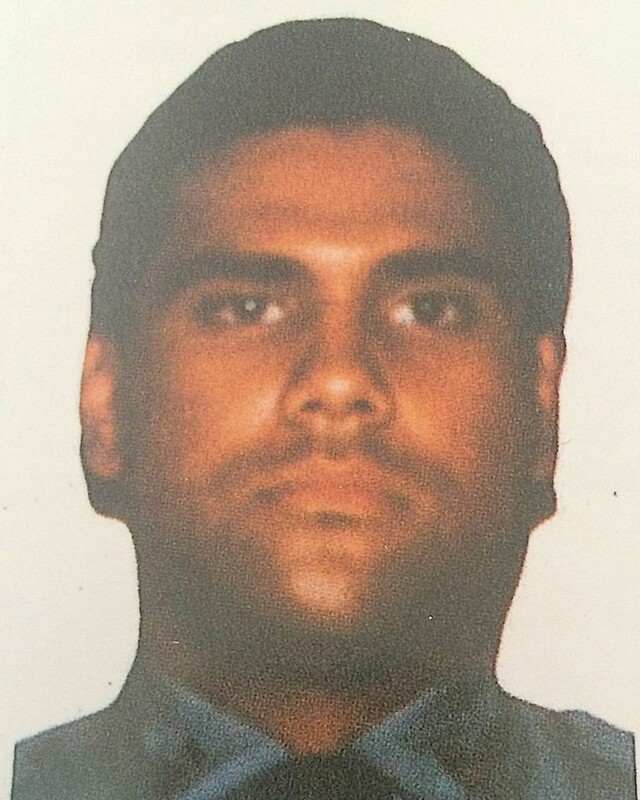 I found this photo in a 1991 NYPD MEDAL DAY BOOKLET about your heroic sacrifice. I felt it was necessary to have a photo on this website so that your family & friends can remember you. Rest Easy Hero! Always Remembered! God toke you away early, but we always cherish the short time we had with you. i grew up in the 47 pct and i remember that day sadly, from what i heard and read and you were a great man. i am now a NYPD cop and will try my best to make you proud! my badge is #307 much love and respect to you and your family! Rest in Peace Hector. You will never be forgotten. May God continue to watch over your family and friends. I think of him often and he is in my prayers. Please say a prayer for his partner that day, Police Officer Patricia Macken (deceased). Although she was not physically injured during the incident, the psychological trauma surely killed her as well. May their murderer never breathe the fresh air of freedom again. He has a parole hearing scheduled for 5/20/16, and is eligible for parole on 9/11/16. Never forget, we won't ....miss you big guy ! you passed to soon my friend , for the short time I was at the 47 I remember you as one of the really good guys that got along with everyone . Happy Anniversary in heaven Hector. R.I.P.